In a fantasy world where the enemy has the ultimate advantage, sometimes a warrior must think outside of the box in order to become successful in battle. The Anime Warrior sword set takes on fantasy battle in a whole new element. The highlight of this awesome fantasy piece is the 19.75" chained double stainless steel blade; there are none like it. A traditional katana may be too predictable for an intelligent enemy, but thinking outside the box may be the key to absolute victory. 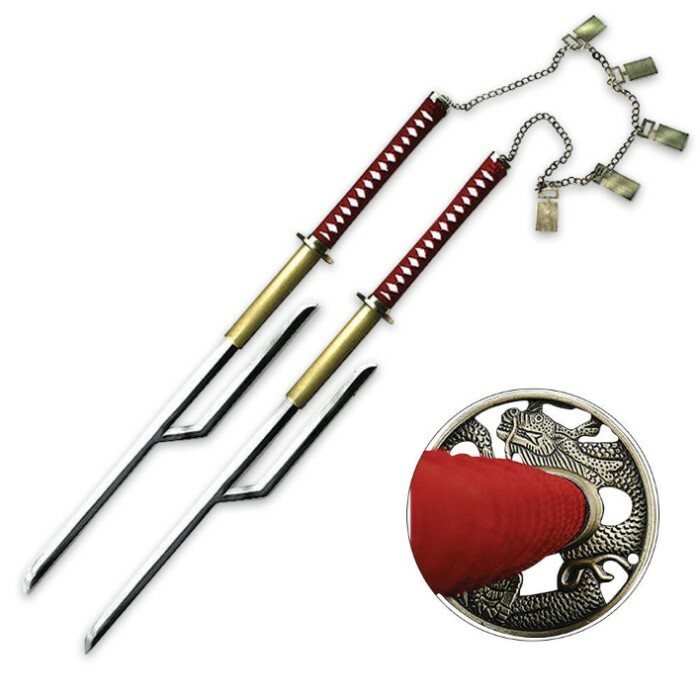 This 38.25" katana sports an 11.25" cloth-wrapped handle and a bronze dragon tsuba. If you are into Bleach, then you must get this sword! The quality is good, especially if using only for display. I was very impressed with it! GREAT swords. really cool. only thing that could have made it better was if the chain was somehow detachable, there was a custom kind of sheath(s) for them, and the very back was metal instead of plastic. it makes a sound as if the sword is falling apart. all but the latter might have made the swords imperfect replicas so they are completely forgivable =) overall 5/5 awesome swords look great mounted on my wall and i feel so royal and BA when i hold them. i got this sword just about 30 minutes ago and at first glance i notice that the black paint on the blade is not painted on very good on one side. thats about the only flaw i found but it may vary from sword to sword. i love these swords and im very happy i got them.